Wildflower – a great combination of mystery and faith! Wildflower the Christian movie has a great combination of a story filled with faith and hope but it also has mysterious, thrilling aspect to it as well since the characters in the story try to solve a murder mystery. It’s somewhat rare to see this kind of story in a Christian movie but I think it’s very refreshing to see a project like this. Wildflower is about a young college student who continually struggles with the memories from her painful childhood and it begins to have nightmares that make her want to deal with what happened in her past and make her want to have a new faith-filled life. In the Christian movie Wildflower, we meet College student Chloe Moray. Chloe has decided to study art and her dream is to become a big name in the art world. She has been very gifted artistically and creatively and this is the start for her to do something great with her life and find her purpose. As soon as she starts her classes Chloe begins to have continuous nightmares that constantly replay in her mind. To have those horrible nightmares replay constantly makes her become sad and depressed. She feels so powerless that she suddenly finds herself at her lowest and Chloe doesn’t really know how to come out of this. The nightmares continue and as she thinks about them more and more Chloe from Wildflower begins to realize that maybe these dreams have some kind of meaning. At first, Chloe thought these dreams were some kind of random sequences of her imagination but then as she continues to analyze them these nightmares remind her of real situations that happened and real places that exist. It’s in this moment that she realizes that these nightmares are things that happened in her past, that it’s not something that she just made up. Chloe begins to investigate and analyze her dreams and the events in them and it turns out that they are related somehow to a murder that happened many years ago. So now that things have become more clear Chloe asks Josh, her friend, for help. Chloe can identify with Josh for many reasons especially because he himself went through tragic moments in his past which he is still dealing with so they decided to work together and try to solve this case once and for all. After they’ve gathered enough information they decide to go to the police and tell them everything that they’ve gathered and learned about but the police really don’t take them seriously and think that what Chloe and Josh are saying is invented. This is kind of a let down for them both and now they have no idea what to do but they decided to continue working together and find that evidence so the police can actually help them. Now both of them seek guidance from God and find comfort in each other, especially Josh. In his past, he had to deal with a tragic, frightening accident that happened when he was younger on a mission trip that left emotional distress in his life. Because of this, he is set to continue helping Chloe solve this mystery and helping her find healing. Both friends continue helping each other through this journey in through the not so easy moments and also find comfort while attending church and seeking a much deeper relationship with God. This actually helps them on the road to healing and they’re doing it together. 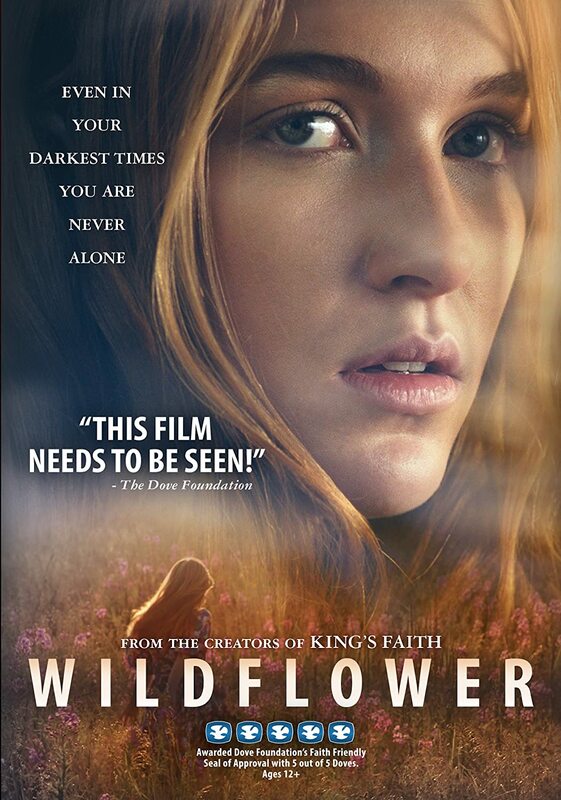 Later on in the Christian movie Wildflower, Chloe is very close to finally solve mysteries regarding her nightmares and the case linked to them, therefore, her faith has begun to bloom once again. Because they kept God at the center of their lives both Chloe and Josh begin to find healing also they help each other work through those insecurities and traumatic events that once had a hold on their lives. While this is happening they also shed some light on an unresolved murder case that went many years without finding what really happened. Like I mentioned before one of the things I love about this movie is the combination of mystery and solving a case plus those faith-filled lessons. If you want to know what happens in Wildflower and see fortunately Chloe and Josh are able to solve the mystery regarding the murder case and her nightmares be sure to purchase this Christian movie at the fishflix store.